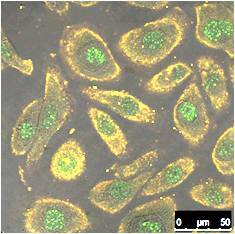 Research project focuses on the antiproliferative effect of type I Interferons (IFNs) in human keratinocytes transformed by mucosal and cutaneous Human Papilloma Viruses (HPV) E6 and E7 proteins, which target and inhibit p53 and pRb tumor suppressive proteins. The study aims to analyse the involvement of virus and cell-dependent target pathways, to identify the molecular mechanisms of type I IFNs antitumor action as well as the oncogenic potential of various HPV genotypes. HPVs are small DNA viruses involved in the development of both benign and malignant lesions localised in different anatomic districts and their life cicle appears strictly correlated to the differentiation program of keratinocytes. To date, the causative association of mucosal high risk-HPVs and cervical carcinoma has been clearly demonstrated. On the contrary, a direct role of the cutaneous beta HPV types in cancer development remains to be proven. More recently, the research project is focusing on the analysis of miRNAs expression profile and on the characterization of the target genes regulated by the identified miRNAs in order to shed light on the molecular mechanisms underlying the oncogenic transformation of keratinocytes by mucosal and cutaneous HPVs. Since there is emerging evidence that cancer cell-derived exosomes may contribute to the recruitment and reprogramming of the tumor microenvironment to form a protumorigenic soil, our research has been extended to the study of these microvesicles. The possibility that HPV-infected cells, by delivering E6 and E7 oncogenes as well as HPV-deregulated miRNAs to the extracellular matrix, can transfer their oncogenic potential to the surrounding not infected cells has been investigated in our studies highlighting the importance of miRNAs and exosomes in diagnostic studies and their role as useful biomarkers. Chiantore M.V., Mangino G., Iuliano M., Zangrillo M.S., De Lillis I., Vaccari G., Accardi R., Tommasino M., Fiorucci G. *, Romeo G.
IFN-beta antiproliferative effect and miRNA regulation in Human Papilloma Virus E6- and E7 transformed keratinocytes. Cytokine 89: 235-238, doi 10.1016/j.cyto.2015.12.014. [Epub ahead of print], 2017. (*Fiorucci and Romeo contributed equally to this study). Chiantore M.V., Mangino G., Iuliano M., Zangrillo M.S., De Lillis I., Vaccari G., Accardi R., Tommasino M., Cabezas S.C., Federico M., Fiorucci G. *, Romeo G.
Human papillomavirus E6 and E7 oncoproteins affect the expression of cancer-related microRNAs: additional evidence in HPV-induced tumorigenesis. [Epub ahead of print], 2016. Mangino G., Chiantore M.V., Iuliano M., Fiorucci G., Romeo G.
Inflammatory microenvironment and human papillomavirus-induced carcinogenesis. Iuliano M., Mangino G., Chiantore M.V., Fiorucci G., Accardi R., Tommasino M., Romeo G.
The role of microenvironment in tumorigenesis: Focus on dendritic cells in human papillomavirus E6, E7-transformed keratinocytes. Cancer Cell & Microenvironment 2: e874, Epub. July 06, 2015. Mangino G., Famiglietti M., Capone C., Veroni C., Percario Z.A. , Leone S., Fiorucci G., Lülf S., Romeo G., Agresti C., Persichini T. and Affabris E.
HIV-1 Myristoylated Nef Treatment of Murine Microglial Cells Activates Inducible Nitric Oxide Synthase, NO2 Production and Neurotoxic Activity. PloS One 10 (6): e0130189, Epub. June 11, 2015. Chiantore M.V., Mangino G., Zangrillo M.S., Iuliano M., Affabris E., Fiorucci G. and G. Romeo. Role of the Microenvironment in Tumourigenesis: Focus on Virus-Induced Tumors. Curr. Med. Chem. 22 (8): 958-974, 2015. Fiorucci G., Chiantore M.V., Mangino G., Romeo G.
MicroRNAs in virus-induced tumorigenesis and IFN system. Cytokine Growth Factor Rev. 26 (2): 183-194, [Epub ahead of print: 2014 Nov 13], 2015. Chiantore M.V., Vannucchi S., Accardi R., Tommasino M., Percario Z.A., Vaccari G., Affabris E., Fiorucci G. and Romeo G.
Interferon-beta Induces Cellular Senescence in Cutaneous Human Papilloma Virus-Transformed Human Keratinocytes by Affecting p53 Transactivating Activity. PloS One, 7 (5): e36909, May 2012. Fiorucci G., Chiantore M.V., Mangino G., Percario Z.A., Affabris E. and Romeo G.
Cancer Regulator MicroRNA: Potential Relevance in Diagnosis, Prognosis and Treatment of Cancer. Curr. Med. Chem. 19 (4): 461-474, 2012. Percario Z.A., Mangino G., Gallo V., Chiantore M.V., Fiorucci G., Romeo G. and Affabris E.
Mangino G., Percario Z.A., Fiorucci G., Vaccari G., Acconcia F., Chiarabelli C., Leone S., Noto A., Horenkamp F.A., Manrique S., Romeo G., Polticelli F., Geyer M. and Affabris E.
HIV-1 Nef induces proinflammatory state in macrophages through its acidic cluster domain: involvement of TNF alpha Receptor Associated Factor 2. PLoS One 6 (8): e22982. doi: 10.1371/journal.pone.0022982, 2011. Chiantore M.V., Vannucchi S., Mangino G., Percario Z.A., Affabris E., Fiorucci G. and Romeo G.
Senescence and Cell Death Pathways and Their Role in Cancer Therapeutic Outcome. Curr. Med. Chem. 16: 287-300, 2009. Fiorucci G., Olivetta E, Chiantore M.V., and Federico M.
Microarray analysis reveals CCL24/eotaxin-2 as an effector of the pathogenetic effects induced by HIV-1 nef. Curr. Drug Discov. Technol. 4 (1): 12-23, 2007. Mangino G., Percario Z. A., Fiorucci G., Vaccari G., Manrique S., Romeo G., Federico M., Geyer M., and Affabris E.
In vitro treatment of human monocyte/macrophages with myristoylated recombinant Nef leads to the activation of MAPKs, IkB kinases and Interferon Regulatory Factor 3 and to the release of Beta Interferon. J.Virol. 81 (6): 2777-2791, 2007. Vannucchi S., Chiantore M.V., Mangino G., Percario Z.A., Affabris E., Fiorucci G., Romeo G.
Perspectives in Biomolecular Therapeutic Intervention in Cancer: from the Early to the New Strategies with Type I Interferons. Curr. Med. Chem. 14 (6): 667-679, 2007. Vannucchi S., Chiantore M.V., Fiorucci G., Percario Z.A., Leone S., Affabris E., Romeo G.
TRAIL is a key target in S-phase slowing-dependent apoptosis induced by interferon-beta in cervical carcinoma cells. Fiorucci G., Vannucchi S., Chiantore Maria V., Percario Zulema A., Affabris E., Romeo G.
TNF-Related Apoptosis-Inducing Ligand (TRAIL) as a Pro-Apoptotic Signal Transducer with Cancer Therapeutic Potential. Curr. Pharm. Design 11: 933-944, 2005. Percario Z.A., Olivetta E., Fiorucci G., Mangino G., Peretti S. Romeo G., Affabris E., Federico M.
HIV-1 Nef Activates STAT3 in Primary Human Monocyte/Macrophages through the Release of Soluble Factors: Involvement of Nef Domains Interacting with the Cell Endocytotic Machinery. J. Leukoc.Biol. 74 (5): 821-32, 2003. Olivetta E., Percario Z.A., Fiorucci G., Mattia G., Schiavoni I., Dennis C., Jäger J., Harris M., Romeo G., Affabris E., Federico M.
HIV-1 Nef Induces the Release of Inflammatory Factors from Human Monocyte/ Macrophages: Involvement of Nef Endocytotic Signals and NF-kB Activation. Romeo G., Fiorucci G., Chiantore M.V., Percario Z.A., Vannucchi S., Affabris E.
J. Interferon Cytokine Res. 22: 39-47, 2002. Federico M., Percario Z.A., Olivetta E., Fiorucci G., Muratori C., Micheli A., Romeo G., Affabris E.
Human immunodeficiency virus type I Nef activates STAT1 in human monocytes/macrophages through the release of soluble factor(s). Blood 98 (9): 2752-2761, 2001. Vannucchi S., Percario Z.A., Chiantore M.V., Matarrese P., Chelbi-Alix M.K., Fagioli M., Pelicci, P.G., Malorni W., Fiorucci G., Romeo G., Affabris E.
Interferon beta induces S-phase slowing via up-regulated expression of PML in squamous carcinoma cells. Co-applicant of the MIUR, PRIN 2005 Grant entitled "Development of new therapeutic strategies against human herpesvirus and papilloma virus infections and their diseases." Co-applicant of the MIUR, PRIN 2008 Grant entitled "Studies on the molecular mechanisms of Human Papilloma Viruses infection and associated diseases to develop novel therapeutic strategies. Co-applicant of the Research Project Sapienza "Ateneo Federato" Grant "Ricerche Universitarie", "Grandi Apparecchiature" a.a. 2005-2011.